All massages and body treatments may be done couples style! In addition, we offer 30-minute add-ons which you can opt to add to your treatment. This is our most popular and extremely specialized treatment blend. It has been designed to “transport you” while easing any stiff & sore muscles by combining Swedish & Deep Tissue styles. A Lomi Lomi treatment (an ancient Hawaiian style where the therapist uses their forearms to close out each stage of the massage) puts the perfect finish on each body area. This total treatment experience improves circulation and is absolutely amazing! This is our personalized Swedish & Deep combination treatment. Relaxation and deep work in the time-honored technique. Using both long/soothing and firm/deeper strokes & pressure points, it’s the perfect blend of techniques to relieve muscle soreness and restore range of motion. Raindrop Technique massage utilizes seven different essential oils to draw out toxins and reestablish a continuous flow of energy up and down the spinal column and across the entire back. The oils are dispensed like little drops of rain above the back and massaged along the vertebrae and back muscles. Different massage techniques are incorporated to push the oils into the vertebrae and muscles and ultimately draw the toxins out. The essential oils utilized in this treatment continue to work within the body for up to a week after treatment. This treatment is ideal for issues dealing with the head, neck, shoulders and especially the spine and back. Our genuine Deep Tissue massage is not for the faint hearted! This is a slow firm technique directed to release tension in deep and superficial muscles throughout the entire body. Excessive physical activity can cause deep muscular and joint stress and this massage helps alleviate tension and stress in specific troubled areas – which improves the overall range of movement in the body. Aids in the speedy recovery of strained muscles. This penetrating massage gives special attention to manipulation of deep tissue to relieve chronic stress and restore balance to the body through the use of specific massage techniques and stretching. Because of increased oxygen flow to the muscle, performance is enhanced. Our therapists can also focus on specific muscle groups used in active sports. Following the idea that a thought or belief can block energy flow as much as muscle tension can, this Hawaiian treatment called Lomi Lomi helps release these blockages, while at the same time giving the energy new direction. Lomi Lomi is not just a physical experience; it also facilitates healing on the mental, emotional and spiritual levels as well. The flow of the energy is increased by the use of the therapist’s hands and forearms in long continuous, flowing strokes, which influence the body to fully relax. Tailored for the expectant mother, throughout this specialty massage the mother’s body will be properly positioned and supported using bolsters, pillows and padding. You’ll be turned ever-so-gently from side to side to do your back and hips, where proper positioning ensures comfort and safety for mother and baby. Some massage techniques (such as deep tissue, sports, Moroccan rain and essential oils), will not be used. Certain areas of the body will be avoided during pregnancy. Our therapist has been specifically trained to do this type of pre-natal massage, so be sure to reserve ahead of time! Our 30-minute Add-ons are a wonderful way to enhance your spa treatment. They may be added to any massage or body treatment. Reflexology derives from the theory that the feet and hands contain reflex areas or zones that correspond to all of the organs in the body. Through the use of therapist’s thumb and fingers, your hands and feet are massaged in order to trigger specific reflex zones in the body to promote total body health and relaxation. Warm oil infused with Rosemary is gently and thoroughly massaged through your scalp. Next, your head is wrapped in warm towels to enable the oils to penetrate the hair follicles. After the towels are removed we continue to massage the scalp, working the oil through the hair for 30 minutes of bliss! We start with a thorough exfoliation of the feet, using a sugar scrub infused with your choice of peppermint or lavender. We then wrap the feet in warm towels to allow the scrub and oils to penetrate the skin. After removing the scrub, we finish this 30-minute treatment with a combination of foot massage and reflexology using moisturizing oils to further hydrate the skin. Our Body treatments consisting of body masks, scrubs, and glows are at once cleansing, smoothing, firming, and detoxifying. They exfoliate skin while fragrant oils stimulate, soften and moisturize. By the way, all of our body treatments include a warm mineral shower to rinse, followed by a light moisturizing finish! Mask or Scrub – What’s the Difference? Our Body Masks consist of a mixture prepared and applied as a drawing tool to achieve a deep cleansing and clarifying of the skin. These treatments usually leave our guests feeling very relaxed. Our Body Scrub, on the other hand, gently remove dead surface cells while refining the underlying pores, and these types of treatments tend to leave our guests feeling very refreshed and stimulated. An organic clay, brought to us from the base of the Atlas Mountains in Morocco, and sought after for its abilities to accelerate cell renewal, and is perfect for aged or sun damaged skin. Also known as Rhassoul, this clay is the same clay the Moroccan people have depended upon for over 1400 years to cleanse, soothe and renew. The finest spas across the globe now utilize it for therapeutic benefits. Through meticulous selection and extensive contact with the raw material, we are proud to offer this rich Rhassoul! This is TRULY UNIQUE IN QUALITY AND PURITY. When first mined, Rhassoul clay appears as polished brown clay, which is chunky in appearance and resembles rocks. After refinement and micronization, the end product is a smooth-almost silken earth. Choose from our wide array of Essential Oils to fragrance your clay. You’ll be lathered gently and lightly massaged as you lay back and relax. After a cocoon wrap, you’ll rinse your Rhassoul Body Mask away in our private hot mineral shower. To complete your experience, your skin will be rehydrated with a very light oil. Our 90-minute Moroccan Clay Body Mask provides you with a truly unique and relaxing sensory experience. We start our 90 Minute Moroccan Clay Body Mask with a dry brushing, which exfoliates and helps stimulate the lymphatic system. Next, warm Rhassoul clay is applied to your body and you are wrapped to allow the minerals in the clay to treat your skin. Once wrapped, you relax on the table and receive a scalp massage while the clay dries. Next, you are led to rinse off in a mineral water shower. After your rinse, you are treated to 45 minutes of our Whirling Dervish massage. You will emerge from your treatment with your skin refreshed and your body fully relaxed! 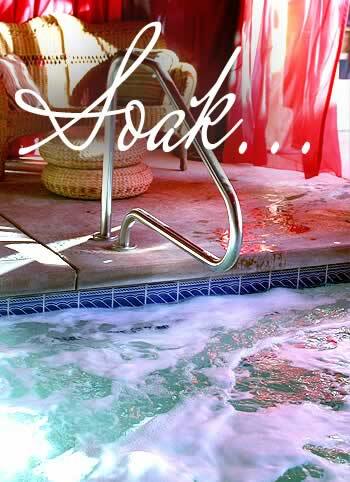 * Add the Moroccan Rain or Deep Tissue massage to your 90 Minute clay for only $25 extra! This is a great treatment for dry skin. Rich oil is infused with organic Moroccan mint and combined with unprocessed raw sugar to create an exfoliating blend. This unique combination is used to refresh your skin and is extremely Moisturizing! Follow up with a warm mineral shower rinse, and you’ll be both relaxed and renewed! For this Moroccan style scrub, we infuse our special essential Cinnamon Oil with unprocessed raw sugar to create a sweet sensation during this stimulating treatment. This combination tones and clarifies, leaving the skin smooth and smelling absolutely delicious! Just after your scrub, you’ll step into a warm mineral shower to rinse, have a light moisturizing finish. You’ll feel totally refreshed and vitalized! you’ll step into the warm mineral shower for a relaxing rinse before your final moisturizing polish. This is our “Total Body Treatment & Massage”! Our facial treatments focus on restoring your skin to its optimum health and natural beauty. A facial not only improves your skin tone and texture, it feels great and in addition, all of our facials include some form of massage to increase blood circulation, which in turn allows better penetration of the products. Relax and feel pampered inside and out! The Skin Care products we use in our facials are natural and botanical in nature and may include essential oils, vitamins and herbal ingredients. Since our products are derived from natural sources including clay shipped to us exclusively from the base of the Atlas Mountains of Morocco (where Moroccans have used it as a drawing tool for over 1400 years) you’re sure to experience an exquisite and unique treatment. All of our facial services here at the El Morocco Inn & Spa include a complimentary skin analysis by our experienced Esthetician who will advise you on which facial treatment is best for your individual needs. Pamper your face with this perfect combination of gentle products and techniques designed to slow the aging process. Perfect for mature skin and those who want to delay the aging process. Brighten your skin and reduce the appearance of wrinkles with a thorough cleansing, toning and removal of dead skin cells. Your Esthetician will apply a nourishing honey almond mask and a high frequency ultra violet light to increase the mask’s absorption into your skin. This facial revitalizes your skin with essential vitamins and improves texture and tone. This treatment is great for most skin types including sensitive, dry, sun damaged and those with rosacea. This is excellent facial for youthful or problem complexions. Achieve healthier, cleaner looking skin. This treatment begins with a deep pore and deep tissue cleansing which rids the skin of excess oils and also stimulates circulation. Additionally, your Esthetician will use a painless ultraviolet light treatment which will destroy bacteria to help clear acne prone skin. This treatment improves blood circulation and the appearance and tone of the skin and muscles of your shoulders, upper and lower back. Includes a deep cleansing exfoliation, mini-massage, mask and moisturizer. This facial helps clear blemishes and leaves you feeling clean, refreshed and relaxed. Relax with a facial treatment designed with you in mind – designed specifically for the needs of men’s skin. Double cleanse. Deep exfoliation. Facial pressure points to relax facial muscle. Followed with a neck, shoulder, scalp massage & beard oil to condition and soothe if needed for facial hair. Please note: As with any facial, always inform your Esthetician of any allergies or special health conditions before your treatments. Please book your spa treatments in advance so we can assure your appointment is provided at your optimum convenience!